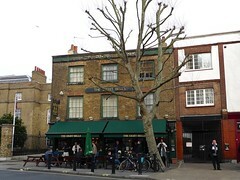 A locals' pub very close to Putney Bridge Station. This is a fairly small one room pub at the bottom of the High Street, though it has four large tables on the pavement outside. Inside tables and banquettes lines the outer walls, the decor dominated by burnished wooden fittings and carpets. The pub's proximity to the station means it's often busy, especially when sport is on. There are two handpulls, with London Pride and Hogs Back TEA on our March 2009 visit. The beer was well-kept and the service was pleasant. Inside, a TV was playing the football, but our large group was able to find space to sit on the outdoors tables. Last visited by Ewan, Kake and other Tube Walkers, 15 March 2009. Last edited 2011-07-28 14:29:10 (version 2; diff). List all versions. Page last edited 2011-07-28 14:29:10 (version 2).